If you would like to sign up for Aeration and Over Seeding, please fill out the form below. We will email you pricing based on your square footage if you did not receive a flier already. We will also notifiy you a few days before your scheduled date so you can mark your sprinklers. Thank you for your business. Bluegrass Seed? Yes or No? RTF Seed-Read Below. Yes or No? 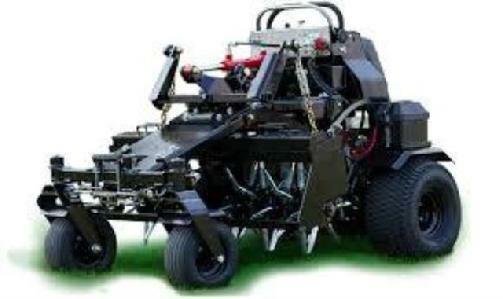 Why Choose Lawn Masters for Aeration? Our stand-on aerator has integrated hydraulics that follow the contours of the ground to pull even plugs over hills and soft ground. It applies up to 1200 lbs. of down pressure on the tines to pull up to 4" cores as compared to 2" cores pulled with a traditional aerator. These extra inches of aeration extends further into your root system to promote immediate nurturing and growth. Loosening soil in the root zone also allows roots to penetrate deeper, which can help turf increase tolerances to drought and heat. Stimulating the growth and hardiness of the turf helps fill in patchy areas. It also helps defend against disease, drought and weed infestation. This is also an ideal time to stimulate your lawn with our seeding options. Please see seeding options below. We only seed in the spring upon request as most lawns have a pre-emergent applied in the spring to combat weeds. Pre-emergent does not allow seed to germinate. For some smaller aeras and backyards that do not have a 36" gate, a traditional aerator may be used. The soil in Nebraska is clay based meaning the soil particles are packed so tightly together that air is driven out, water can’t drain through and plant roots can’t easily penetrate it. In a lawn, this translates into shallow rooting and poor turf health. To combat these issues, it is recommended to aerate your lawn 1-2 times per year. Kentucky Bluegrass Seed Blend is formulated to provide rapid establishment with exceptional turf quality and turf density. Turf Saver with RTF® is the most advanced tall fescue blend on the market. RTF, rhizomatous tall fescue, gives Turf Saver the added value no other tall fescue can. This premium blend will display excellent germination, growth and color. Turf Saver with RTF will become green earlier in the spring and stay green longer in the fall. If your lawn gets use and portions of the lawn thin, RTF will send out new rhizomes and fill in the bare or thin spots to give you a healthier and thicker turf. It has excellent drought and heat tolerance with much less irrigation than other varieties of grass.